As college basketball teams get ready to start the season they take the court in exhibition games against feebler opponents. These opponents are generally small schools who will get paid well for the game. Players on the teams are talented but not nearly as good as the big schools. They specifically lack height. On the basketball court you often see exhibition teams sending out teams of little people when compared to bigger schools. You feel bad for the exhibition teams who trot out their 6’8″ centers against the seven footers of bigger schools. I’d compare it to watching your buddy approach a super hot girl at a bar to try and get her number. You know it’s a mistake, you’ll know he’ll be met with catastrophic failure, but you root for him because he’s the eternal underdog. As he walks across the bar you see he’s nervous, he even knows he’s going to fail, but he’s accompanied by a desperate sort of confidence. He has nothing to lose. If he tries and fails then life continues as normal, but if he tries and succeeds then he has achieved greatness. Roy Williams: In observing Roy’s substitution pattern, I was surprised by how closely it resembled his pattern for a typical regular-season game. I thought there might be more experimental line-ups and even more scorer’s-table chaos than usual. Really, though, it was a tight 9-man rotation for most of the game’s first 30 minutes. Bullock replaced Strickland at the 2 around the under-16 timeout, then Strickland replaced Marshall at the 1 near the under-12 timeout. I’d expect that rotation pattern to be rather consistent. The starting 5 played 12.9 minutes as a unit (in which they led 34-23)– a total that’s in line with how they’re used in the regular season. As McAdoo gains seasoning, he’ll be the first frontcourt reserve (it was Watts-for-Henson vs. Pembroke). And the starters will play more total minutes in close games, of course. But already, Roy seems to have a very good handle on how he wants to utilize his personnel this season. Every Friday, a group of fearless webmasters and sports fanatics from around the Triangle will gather to predict five college football games against the spread. 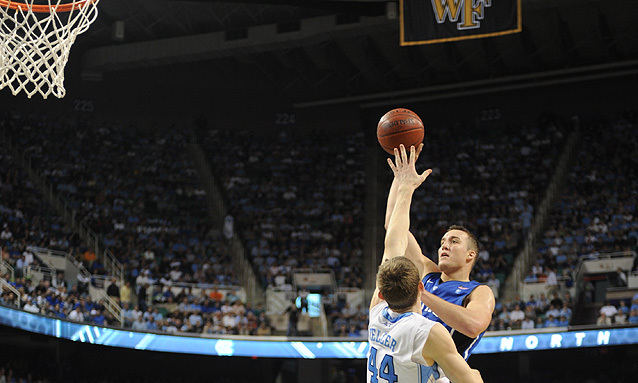 Every Duke, Carolina, and N.C. State game will be featured, along with a smattering of high profile non-Triangle games. As the season goes along, we’ll keep the standings updated and see who emerges as the one true prophet. Make your predictions in the comment section. Each week, we’ll feature any and all commenters who pick all 5 games correctly. With a win or a draw tonight, Duke will secure the title and the #1 seed going into the ACC Tournament, which they’ve never won. As I’ve mentioned before, I’m covering the team for a feature story, and I’ll be there in Raleigh this evening. Due to distribution problems at Maple Street Press, the fifth edition of Tar Heel Tip-off will not be available in a print version this season. I have chosen to make my Tip-off content available to read/download (for free!) at issuu.com, though. This includes a 2011-12 season preview article, as well as four-page player profiles for each of the eight returning rotation players. If you can’t see it above, check it out at issuu.com. You’re seventeen years old. You’re the best basketball player in the nation and you can go to any school you want. Both Duke and North Carolina have come calling and Coach K and Roy Williams are throwing their best recruiting techniques at you. You decide to go through a list of pros and cons comparing the two coaches to make your decision. Reading through various preseason reports and articles I’ve noticed a pattern has begun to emerge regarding the Plumlees and their potential contributions to this years Duke Blue Devils. Instead of relying solely on words to describe the play of the Plumlees I will show you what they will bring to the table.